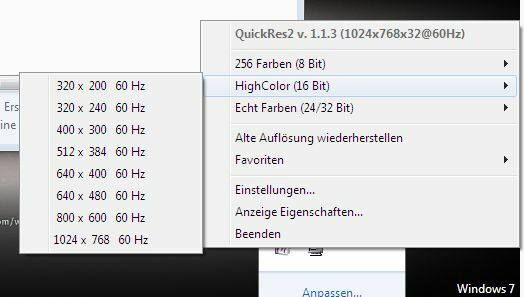 QuickRes2 is a tool that allows you to quickly change the resolution and color depth of your Windows workstation’s monitor. QuickRes2 sits in your System Tray waiting for your commands. It displays a list of all resolutions and color depths supported by your monitor. After switching to a new resolution QuickRes 2 keeps your previously used resolution to quickly revert the changes back to normal. You can also create a favorites list with your commonly used resolutions. QuickRes2 is one of my oldest projects. I had taken it offline for two years because I thought no one would be using it any more. … How false I was 😉 – I got several requests to take it back online… You request it. You get it: QuickRes2 is back. It’s still the same code base and runs on Windows 7 as well.